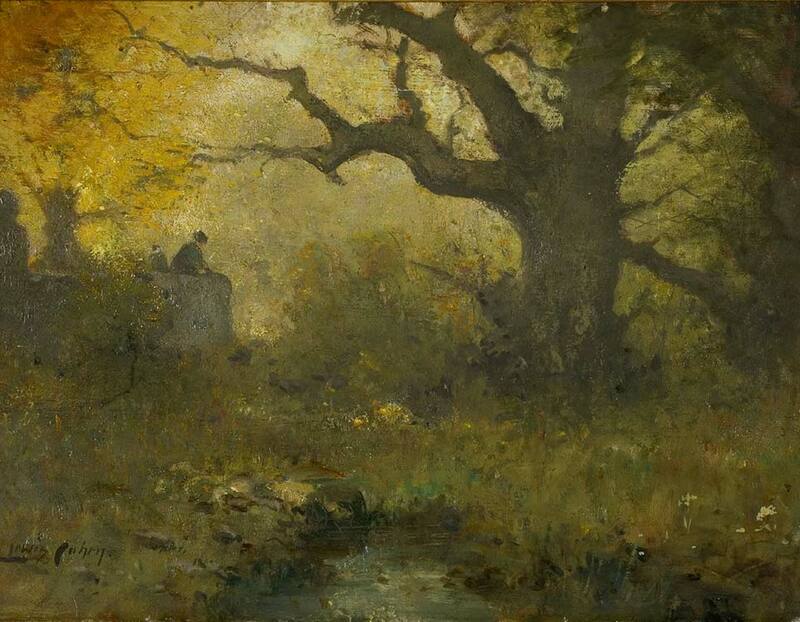 The first artists to come to Old Lyme painted in an artistic style known as Tonalism, characterized by subdued and poetic landscapes that were rich with mood and sentiment. Twilight and dusk were favored times of day for the Tonalists, as were more atmospheric conditions of fog, mist, and rain. They painted dimly lit woods and rural settings, and finished them with a layer of toned varnish. Critics derisively referred to them as the “baked apple school” or “brown gravy school” for their use of dark, more somber palettes, but the Tonalist artists sought to create complex images steeped in nostalgia that would look perfectly at home in a collection of Old Masters. The Tonalist catches the laughter of shimmering light, and transmutes it into pictorial joy; he speaks admirably the old mother-tongue of cloud, tree, pool, and stone; he interprets the spring; he is summer’s scribe, page to the majesty of autumn, and priest to the whole round year. With a simple palette, and as if by magic, he expresses breadth, teasing transparency, mysterious distances, the illusion of luminosity—in a word, the drama of air, light, and colour. With Henry Ward Ranger as their leader, these pioneers of the Lyme Art Colony were fixed on establishing an American version of the French Barbizon group of painters. 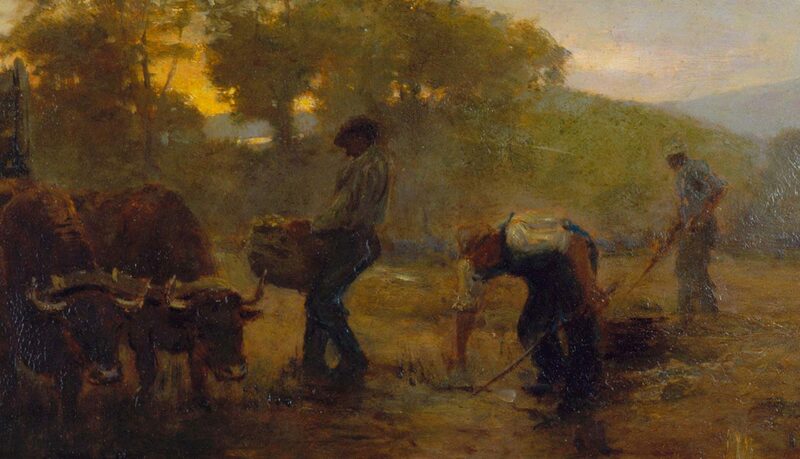 Working in the French countryside in an area known as Barbizon, near the Forest of Fountainbleau (south of Paris and reachable by train in an hour’s time), a group of landscape painters sought to capture the unspoiled countryside and rural traditions before they were eclipsed by modernity. 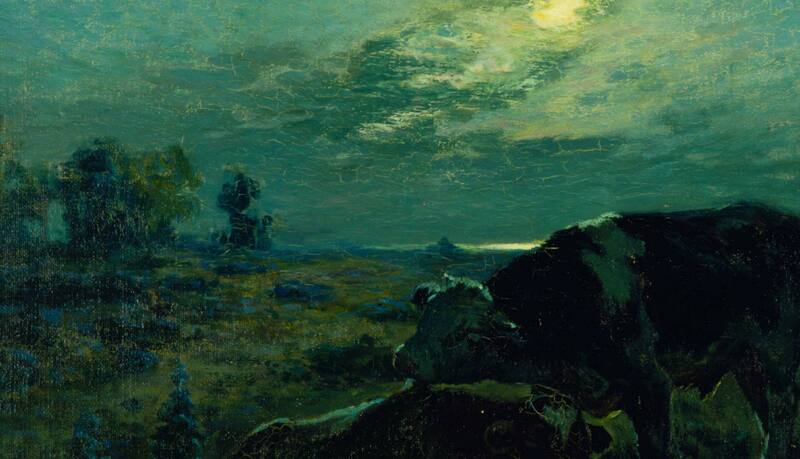 French artists such as Theodore Rousseau, Constant Troyon, Charles-Francois Daubigny, Jean-Francois Millet and Camille Corot were associated with this group. 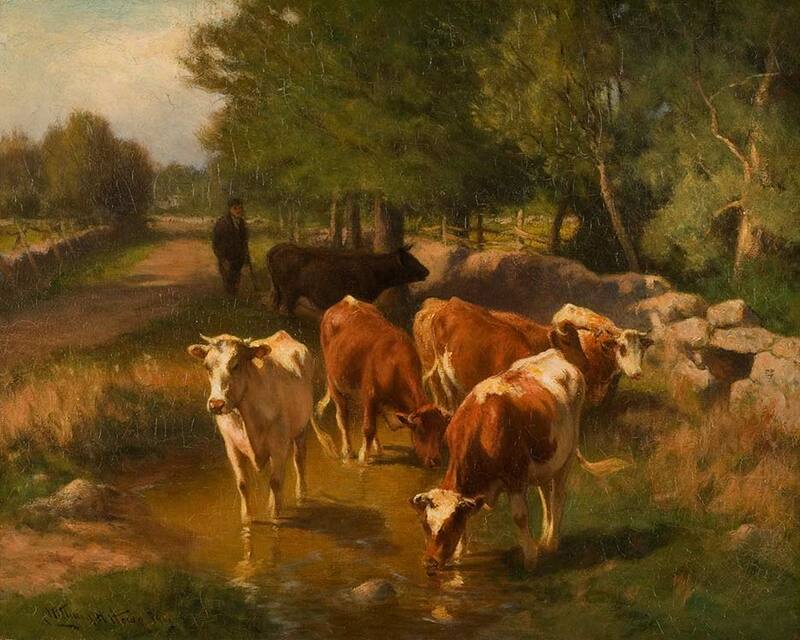 Choosing the woods and farmlands of Connecticut rather than France, these American artists would paint similar scenes they found in and around Old Lyme. Like the French artists, they sought to capture the old-fashioned qualities of the region, the quiet forest interiors and time-worn small farms, using earthy tones of browns, golds and muted greens. In the beginning, the colony was considered the American Barbizon. I feel that my little bit of New England, which I know and love so well, is reeking with poetic suggestion…. Our farms which were thoroughly tilled for a century or more have, for the past hundred years, been slipping back into picturesque neglect . . . [and] in New England, the country lanes are full of brush and grass and flowering weeds, with the little-used wagon truck zigzagging between tumbled-down stone walls and rickety rail fences.